I must’ve heard this 100 times when I started telling people about our next trip. No, it’s not Florida. It’s not the sugar-white sand of 30A. Know what else it’s not? Over-populated! If you’re my age you might remember Destin vacations as a kid with precious little to do but build sand castles, play in the surf, and watch your Dad chase sand crabs. 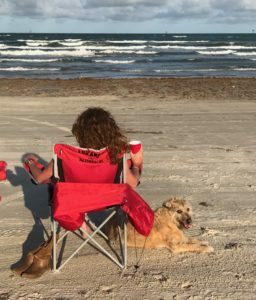 If you miss or just crave that sorta thing, then pack the car and head to Port Aransas, Texas before it’s too late. Boots off, toes in the sand. 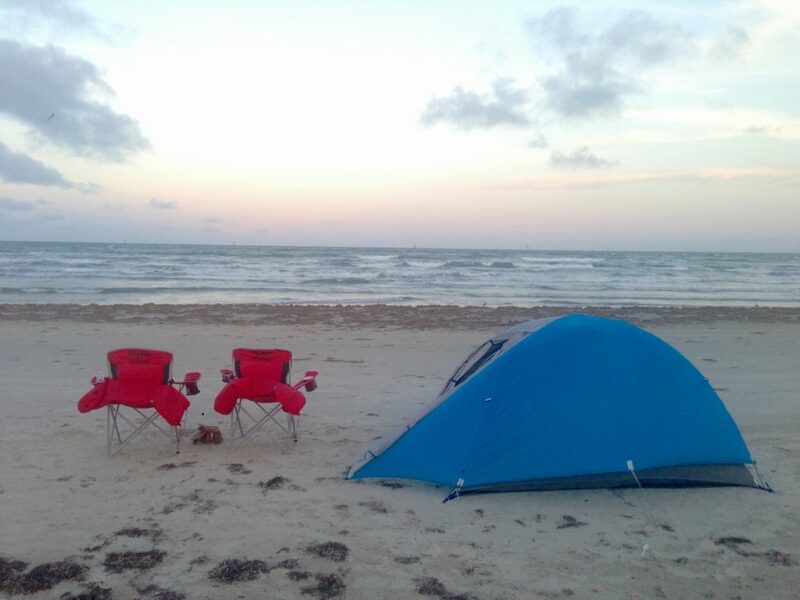 There aren’t a lot of beaches where you can pitch your tent in the sand, build a fire, fall asleep in your chair, and awake to a gulf sunrise with waves crashing on the shore a mere 50 feet from where you slept. Mustang Island State Park is one of those places. That’s probably why you hear it referenced in songs. Perfectly timed, we were checked in at the ranger’s station and had our tent sent up just in time for sunset and some Razorback baseball on the radio. Solo cup in hand, dog at my feet, I sat in my chair and stared at the ocean as the sun lowered itself over the dunes behind us. This was the beginning of my next trip around the sun, and in the morning, I’d start it at the beach with my dog and one of my best friends. I have a friend who only celebrates prime numbered birthdays and lots of people only acknowledge the multiples of five. I celebrate them ALL and tend to gravitate toward water when I get the chance. Until I turned 40 it was a month-long festival. Now, I’ve scaled back to a more respectable fortnight, but that’s mostly because I think it makes me sound educated and refined. I’ve also discovered that if I do both pre- and post- fortnight celebrations, I still get roughly a month. After a few innings of baseball, the pinks of a gulf sunset had turned to dark blue. This would have been the perfect night for dinner on the beach but we didn’t plan for that. Reluctantly, we got back into the car to go in search of people food and a liquor store. Please note: You are not supposed to have alcohol within the state park or glass on the beach. Those are the official rules. Also, the park gates are locked after 10 p.m. but you’ll be given the code so you can get back to your campsite if you leave. Mustang Island is an 18-mile long barrier island on the Texas coast. At the southern end of the island are Padre Island and the JFK Causeway that connects to Corpus Christi. At the northern end is a the small, funky town of Port Aransas. The park ranger had given us a map of the beach and personal drawings that led us where we needed to go in ‘Port A’. We stopped at the liquor store first because we didn’t know what time they closed. I wasn’t expecting great things from a small island store but WOW! WB had all our favorite bourbons, several of our favorite wines (yes, Dad, they had Freakshow), and friendly, if slightly overly helpful, staff. Through all the friendly chatter, we did learn a new term for Bud, Bud Light, Miller Lite, etc. An island local and liquor store regular only drinks craft beer and refers to all others as “Peasant beer.” I’ll be using that. After making some rearrangements in my hot pink Igloo Sportsman with the rhinestone Razorback decal, we were headed to the downtown area to a sports bar called Stingray’s Taphouse & Grill. A contact at Port Aaransas Chamber of Commerce sent me a list of dog-friendly joints and this little sports bar was one of them. I’d called to confirm if a) they were indeed dog-friendly and if b) they would put at least one of the TVs on Razorback baseball for me. I didn’t know at the time that the game wasn’t televised; they tried very hard to find it. With multiple water bowls placed across the patio, a Golden Retriever sacked out on the floor and a little mix under another table eagarly wagging his tail, you can count on this place for dog-friendly service. It wasn’t too crowded and we could hear the solo guitar player from the patio of The Gaff, another dog-friendly bar, next door. I ordered oysters- yes, I know there’s no ‘r’ in the month of June- and Chris tried Stingray’s Makers Mark burger, a hand-patted beef marinated in Marker’s Mark bourbon. I also ordered a Bloody Mary that’s worth mentioning. Called the Texas Pre-Game, it’s made with Absolute Limited Edition Texas Cucumber & Serrano Chili vodka and rimmed with hickory smoked sea salt. There’s no photo because it didn’t look all that special, but it’s good. This thing ought to come in a Mason jar and be bigger. Like Texas. After dinner we headed back to our beach resort to stare at the stars and listen to the waves. More campers had arrived since our departure and right next to us was a Latin American rave club. Lest you doubt me, they had a disco ball. It was too dark to pull up camp and mover further down the beach but thankfully, with our car parked between the two camps, it wasn’t too bad. If you ever go to Mustang Island State Park to camp, drive a little further down the beach. The camping area is a five mile stretch and the further down you go, the less people there are. The next morning I was up early, sometime after sunrise but with the sun still pretty low in the sky. I needed coffee and I needed Chris to wake up and handle the camp stove for hot water. We had to get moving! While in town the previous night, I noticed an announcement on the marquis. I wasn’t sure what it meant but I was sure I was gonna be there. I’d been praying to the Turtle Gods for weeks that I’d get to see a crawl while on this trip and my wish had been granted. I knew from the website that four nests were estimated due to hatch between May 30th and June 4th, but those usually happen very early in the morning on Padre and it isn’t the sort of thing you can plan to put on a marquis. No matter. I’d asked the Universe for birthday turtles and I was getting them. Right after my coffee. 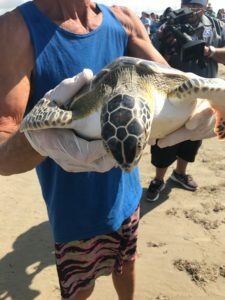 Animal Rehabilitation Keep (ARK) rescues and rehabilitates marine turtles and birds from the coastal zone of Mustang Island and St. Joseph Island. 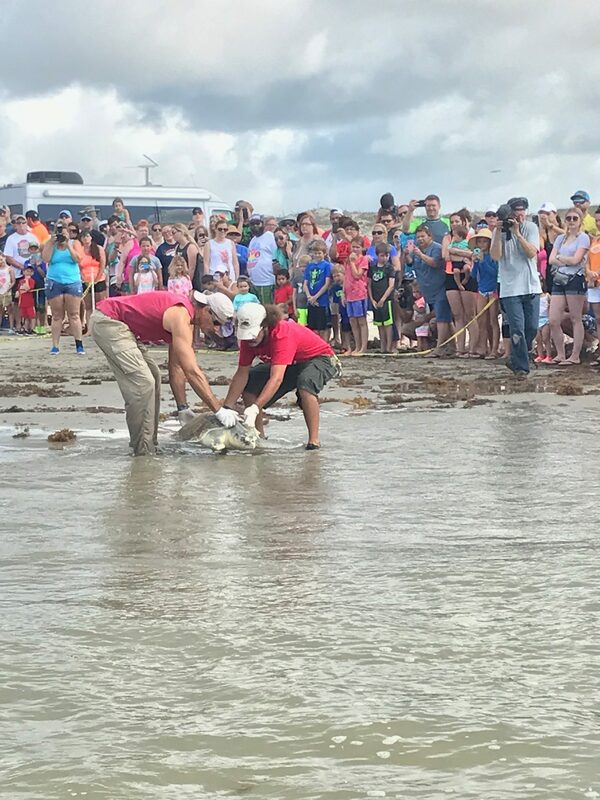 Those that recover are released back into their natural habitat and on Saturday, June 3rd, they had 19 turtles ready to return to their ocean home, including the endangered Kemp’s Ridley Sea Turtle. Why aren’t we rolling in this? Since leashed well-behaved dogs are allowed, we arrived about 45 minutes early to make sure we got a good spot. ARK volunteers had already blocked with caution tape a wide lane for the turtles to make their way to the ocean and bystanders were encouraged to help clear it by removing the clumps of sargassum that blocked their path. A microphone and loud speaker were set up and a volunteer was keeping us posted on the turtles’ ETA. 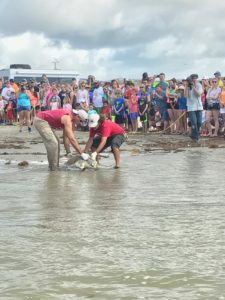 We all cheered to welcome the turtles when the trucks pulled up, and one by one, gloved volunteers carried the turtles from the trucks to the water with their flippers flapping ever more rapidly as they neared the drink. The volunteers made sure to let all the party guests get a good look and stopped to allow pictures and answer questions. They saved the biggest one for last and it took two grown men to lift him from the truck to the beach. I think the intent was to let him crawl to the water himself, but when he didn’t start moving, they carried him. Henri didn’t have near as much fun as I did at the turtle party and I was once again reminded of his age. He doesn’t tolerate the crowds as well or as long as he used to and he has trouble recovering when something goes wrong or startles him (like a kid dropping their plastic sand shovel on him). Though I thought he’d be ok standing with Chris while I waded out into the ocean to watch the turtles swim away, he was completely undone and I returned to a trembling dog. Since we were blocked in by other vehicles- mostly golf carts- the best I could do for him was let him sit in the car and give him some Rescue Remedy. By 11:00 we were getting pretty hungry, and with Henri long since ready to go, as soon as we were able, we made our way down the beach to grab some lunch. We stopped in at The Beach Lodge, Port A’s only hotel with a restaurant and bar located on On The Beach Drive. Pet-friendly lodging with no size or breed restrictions, I’d hoped this place would be just like The Sea Gypsy Inn in Ft. Myers. The gypsies are some of my favorite people, so my expectations were probably a little high. Given the Facebook reviews, I knew it might be hit or miss, but I wanted to give it a look-see. The bar and back patio overlook the gulf. On the side patio, where dogs are allowed, the view is blocked by dunes and you’ll have to walk through the bar to get there. No one minds or even gives much notice. The menu is basic and the service slow, but if you want a cold beer on the beach, this is the place to go. I didn’t get a chance to peek into the rooms, but I did notice that each had a window unit for air-conditioning. If four-star luxury is your style, this ain’t your place. What they call a ‘sangria’ is, as best I could tell, wine and sprite. Stopped for a drink. Stayed for the stories. After lunch we headed down town to Shorty’s Place, the island’s oldest bar. I’ve got three pages of notes on this trip and one page is full of the island history (cannibals) and local gossip (murderers and thieving rats) I picked up here. 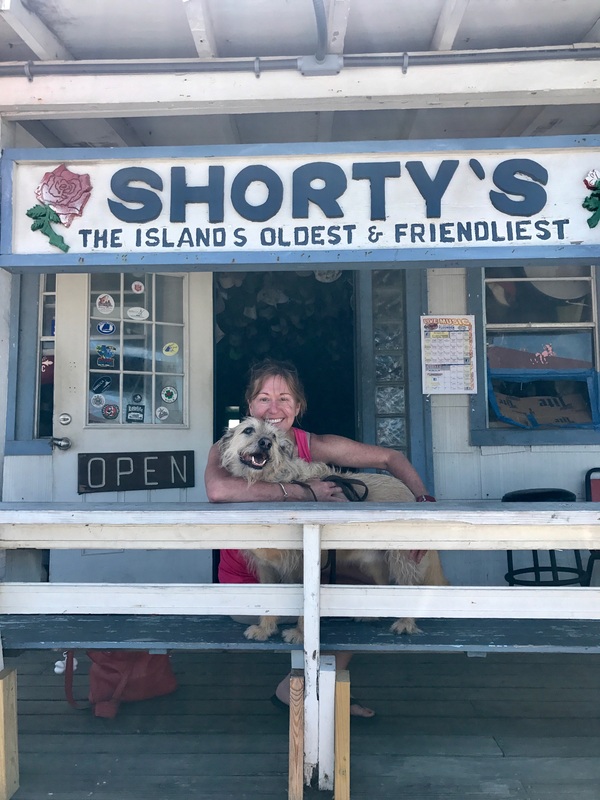 The bartender Renee was an absolute hoot and a local couple in the midst of day drinking, chimed in with their own stories. You’ll find that Woodford is their only bourbon, and if you order a drink with soda, they have the fancy stuff. There’s a cigarette machine, a pool table, and video golf. A sign on the wall says ‘No Children after 8 p.m.’ and I’m guessing it wouldn’t be great for dogs either. 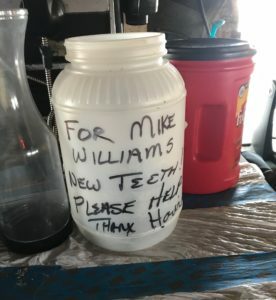 On a shelf behind the bar sits a large, plastic jug. 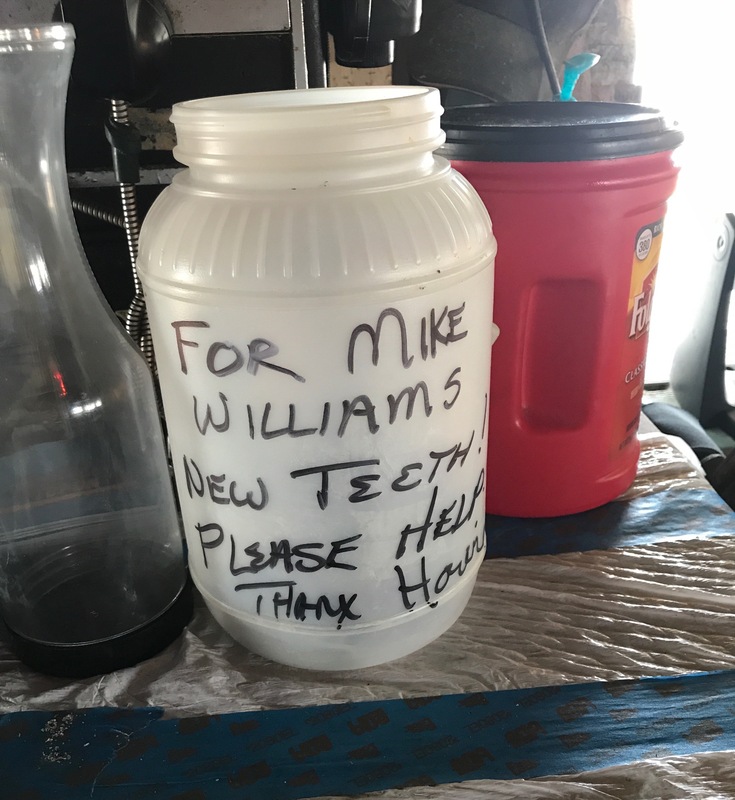 Seems a local resident had his false teeth stolen from his night stand by a rat and they are taking up a collection to buy him some new ones. For real. The story made The Island Moon, Port A’s free weekly paper. You should grab a copy if you’re in town! The original owner, nick-named Shorty, was murdered at the end of the bar by some young punk, and her daughter Rose took the reins. Rose has passed on too, but her birthday is celebrated every October with the ‘Pig Party’ featuring live music, and what else but a pig roast. There was at least one other ‘owner murdered’ story, a son, I think, and several stories I just can’t repeat in this blog. I’m pretty sure having your teeth stolen by a rat is the best though, and I’m equally sure that something new happens every week. If holes in the bathroom floor, old, moldy hats on the ceiling, or inappropriate adult language and content bother you, please don’t go here and say I sent you. Our next stop was The Shops at Old Town. I happily discovered that these eight local clothing, art, jewelry and home accessory shops anchored by The Phoenix restaurant and an open-space courtyard are all owned by women. So is The Phoenix. What initially caught my eye was the restaurant and a place called Tippy Toes. They sell fitted toe rings and I’ve been looking for just the right one. 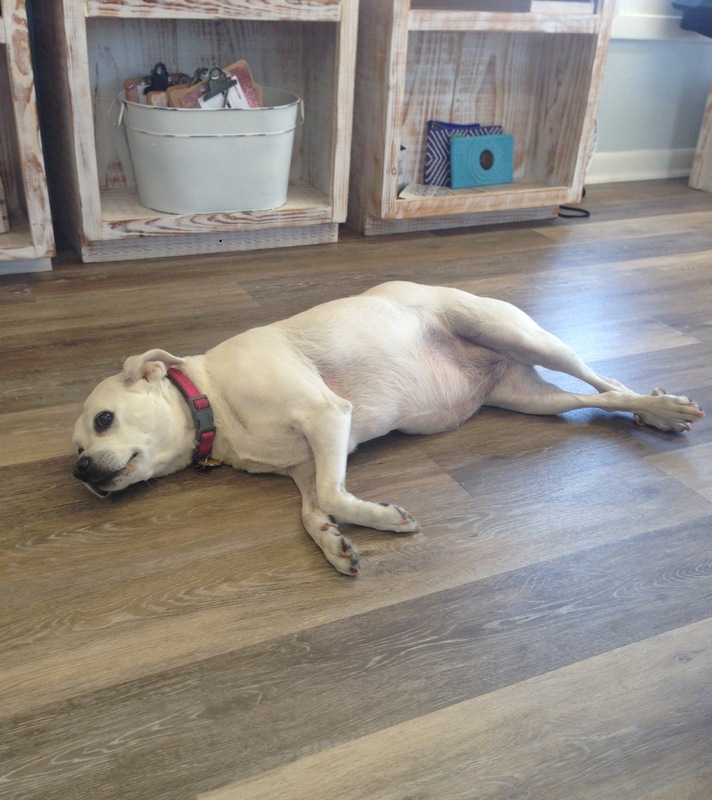 Madison is the shop dog, but she doesn’t like other four-legged visitors. 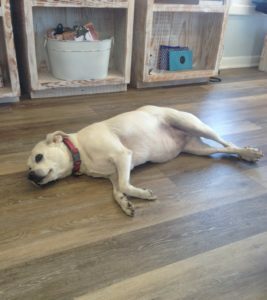 If you want to go inside with your own pooch, Madi’s Mom will take her to their other shop then come back and fit you for your new toe ring. The patio at The Phoenix restaurant is shaded and dog-friendly. I hopped out of the car to ask before we parked and when I returned, the hostess was waiting to show us to our table and a bus boy was standing beside her with a bowl of water for Henri. The menu is best described as Asian-Beach fusion, maybe, if there can be such a thing, and it includes sushi as well as some American dishes. Since we weren’t hungry, I had a Dark and Stormy then left Chris with his beer while Henri and I shopped. Our plan was to return for dinner, but we napped on the beach and didn’t wake up until 8 p.m. They close at 9. In addition to beach shops and dive bars, you can find plenty of other dog-friendly things to do in Port A. Rent a golf cart and drive on the beach, take your pooch for an off-leash romp in the dog park at the Port A Community Park, go fishing and find a restaurant to cook your catch, or take a kayak, canoe, or paddle board excursion on the state park paddling trail. If you throw in a visit to the Wetlands Education Center at the Marine Sciences Institute where guided tours are dog-friendly based on group size, you’ll need more than just a weekend to really enjoy it all. Our plan to spend one more night on the beach was thwarted by sketchy weather. Storms were in the Sunday morning forecast for 10 a.m. Then it changed to 8. Then to 6. I sat in my chair watching lightening flash across the horizon and pondered the wisdom of risk. I did not want to be breaking camp in a storm, but further more, I didn’t want to be in a tent if that storm got upgraded to something worse. I’d seen the photos in the Island Moon of the Memorial Day campers abandoning their vehicles and campsites to scramble to higher ground. The only problem with our relocation plan was finding dog-friendly accomodations in a tourist town, on a Saturday night, during the first official weekend of summer. Everyone we called was friendly but booked. We ended up hauling it to Corpus Christi and checking into the Best Western there. I think Henri was very happy with that decision as I’ve never seen him run into a hotel room so quickly. I didn’t mind too much either since a dip in the ocean on Saturday morning was the closest to clean I’d been since Thursday. It didn’t take any of us very long to fall asleep and the storm never came. Checking in late night we didn’t notice the marina across the street. That gave us an excellent chance to get in a little walk and engage in some boat envy. It also allowed us to get up-close and personal with the Texas state bird. There is a large grassy median across from the Best Western that looks like a great place for a dog to potty. It’s also apparently where the mosquitos nest and they wake-up hungry and viscous. Don’t go there. Stick to the small grassy area on the hotel side of the street. We only spent one night in Corpus but it was long enough to find a dog-friendly oyster bar. Right across the street from the hotel within easy walking distance is the Water Street Market featuring the Executive Surf Club and its dog-welcoming patio complete with water bowls. They are open until 11p.m. SU-TH and 12 p.m. F-SA. You know, in case you have to pack your tent and head to higher ground after dark! We were a little concerned about driving on the beach without a high clearance or four-wheel drive vehicle, but it was no problem. The roadway is well-maintained and we saw everything from RVs to sports cars making their way down the beach. Park entry fee is $5.00/person with 12 and under free. Overnight ‘primitive’ campsites are $10.00/night. Pets must be on a leash, in a car (please don’t leave your dog in a car in Texas! ), crate, or your tent at all times. Leashes can be no longer than 6 ft.
You must be with your pet at all times and may not him leave him unattended in the park, your vehicle, or at your campsite. No noisey or dangerous dogs allowed. Pets are not allowed in state park buildings. This includes motels, cabins, screened shelters, group facilities and restrooms. You must pick up pet waste. You do not need a fishing license when fishing from the shore or jetty within the state park. Bag and length limits, as well as other regulations still apply. If you want to build a beach fire, take a shovel (lest you find yourself borrowing one from a friendly neighbor). You’ll need to dig a hole in the sand for your fire pit. Take extra wood, too. Baby powder. Sand is going to be everywhere! To minimize tracking it into your tent or car, sprinkle some baby powder on your feet then brush it off. Tailgate tent. You might want it for shade; it might get blown over by wind. Take it anyway. Pop up shade and gel cooling mat for the dog. Iron skillet if you want to cook and a French press if you need your morning coffee. Bug spray, and I mean the kind with DEET. 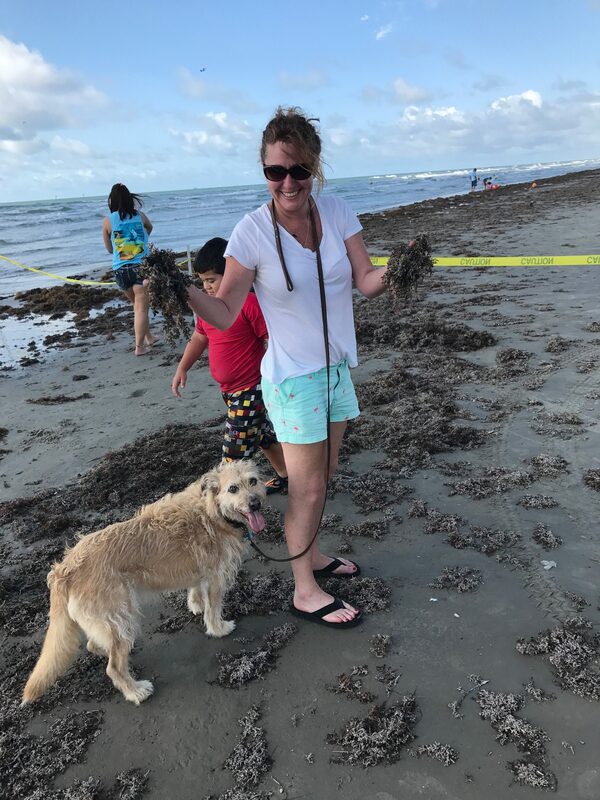 We didn’t have any problems on the beach or in Port A, but as soon as we got there I sprayed everyone’s feet and legs (yes, Henri, too) with OFF! 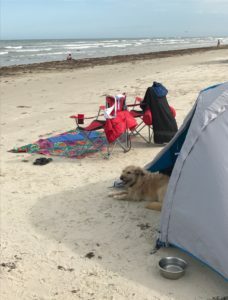 We loved our time on Mustang Island and in Port Aransas. The people are friendly, the weather is nice, and it isn’t too touristy- yet. No, the beaches aren’t like Florida, but it isn’t a river bank in Arkansas either, and they have TURTLES! In fact, turtles will be hatching from now until September. So it’s a great time to go. This is no doubt a trip we’d do again. Who wants to join us for a Pig Party in October?! For more photos and adventure follow Travel Tails on Facebook or @mytraveltails on Instagram and Twitter. 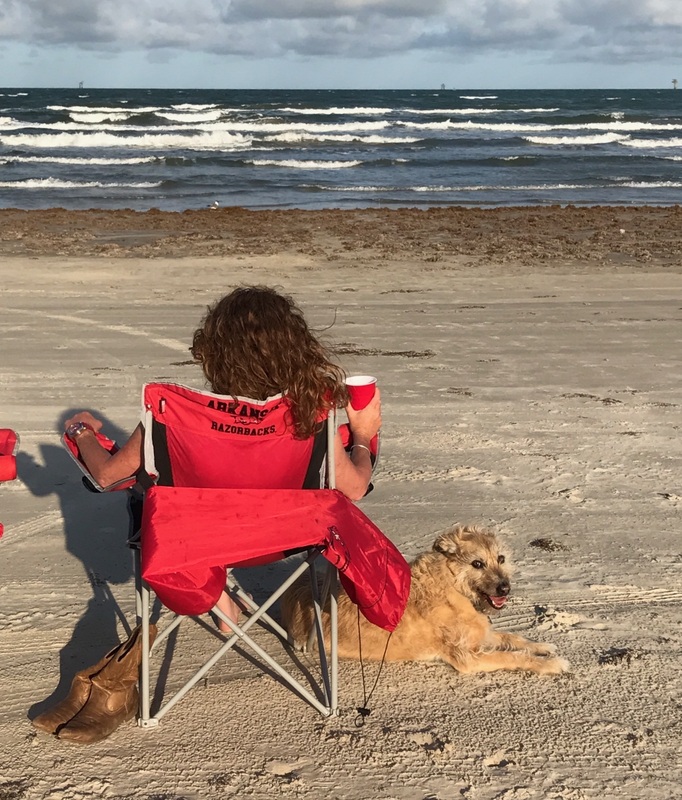 We go to Port Aransas every September or October and would love to meet you at the Pig Party in October. It’s an easy 4 1/2 hour drive from Austin and we always stay in a super pet-friendly cabin/house in the Spanish Village. Hi Carmen! Thanks for sharing. I’d love to know more about where you guys stay when you visit. I’m hoping we can get back there for the Pig Party and some paddling, but if not, Austin is on our list, too. You can be our tour guide. I heard about those! Cracks me up and looks like a fun time, though I’m not sure how Henri would feel about the noise if it was loud. Thanks for reading and sharing! Port Aransas, in addition to being dog friendly, is also deaf friendly. Edwin and Amy Myers operate Kodys and Giggitys restaurants as both have deaf parents, and both are certified sign language interpreters turned restauranters. They operate Shortys Place too! Hi David! I knew I liked those Shorty’s people! Thanks for reading and thanks for the additional information. I will share this on the Facebook page in the next few days.